The National Gallery of Modern Art in New Delhi is a place I love going to, although I must also say that I don’t visit it as often as I should. One of India’s few- and the best by a long shot- state-owned art galleries, NGMA’s collection is a medium sized but fascinating one. Leaving aside the Gallery’s collection of contemporary Indian art- which is sizable- its the permanent exhibits of the Bengal School of Art and those of other artists related to it like Amrita Sher-Gil, that keep drawing me back. There’s a degree of inventiveness and boldness to the work of this large body of artists that I find lacking in most of our contemporaries. 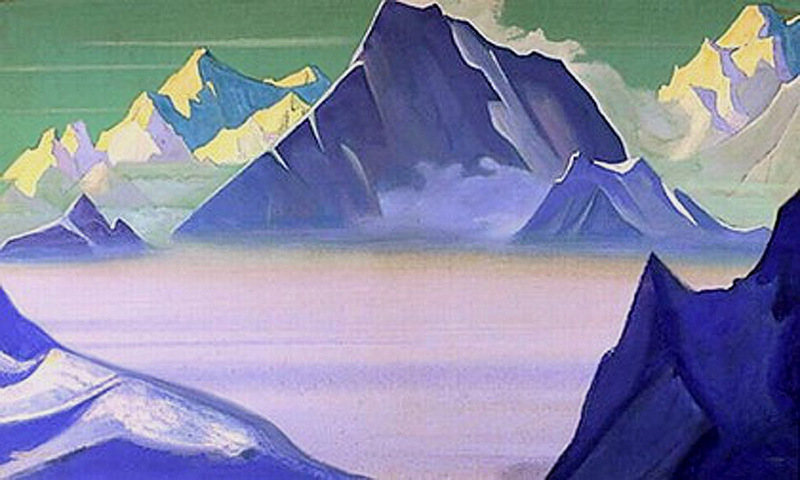 The collection that I never miss, however, is that of the Russian artist-philosopher-mystic-anthropologist-archaeologist-traveller Nicholas Roerich. 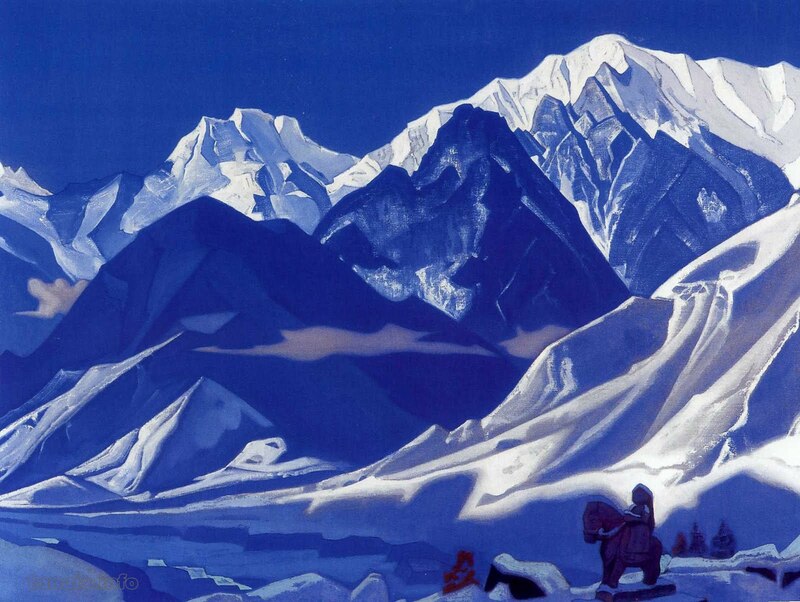 His mountain paintings are unmatched in their breadth, depth and scope. Its almost like stepping into an alternate universe where mountains perform the roles of deity, habitat, scenery and a spiritual challenge all at once. And that’s just on one level. At another, they are masterful studies in light and tone. 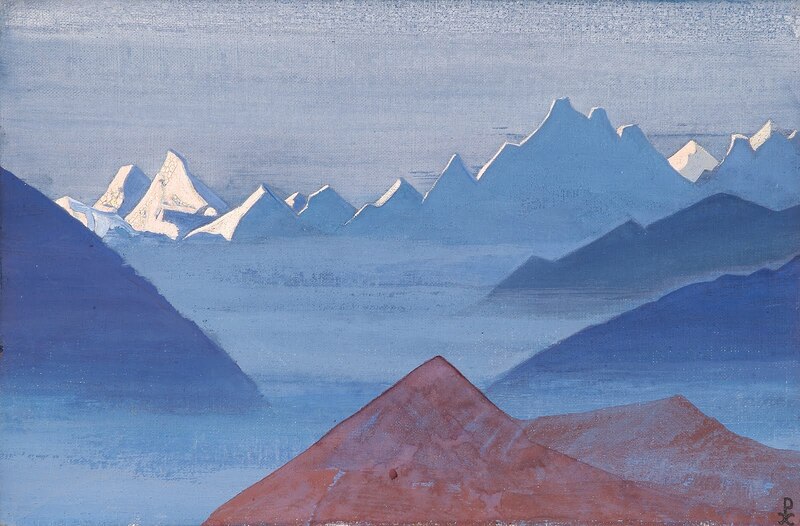 Although Roerich has as distinct a style as any painter, no two mountain studies are similar, even when he’s painting the same mountain from essentially the same vantage point, as these superlative studies of Kanchendzonga show. 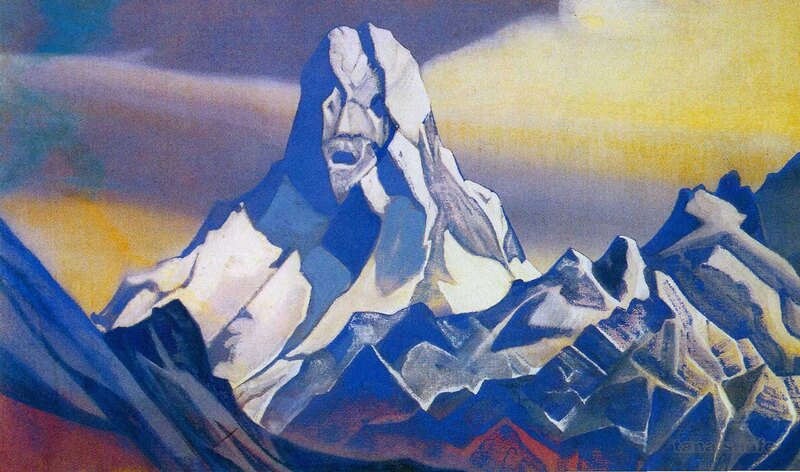 In no other artist’s depiction of mountains have I seen geography consistently appearing as fully fledged characters. 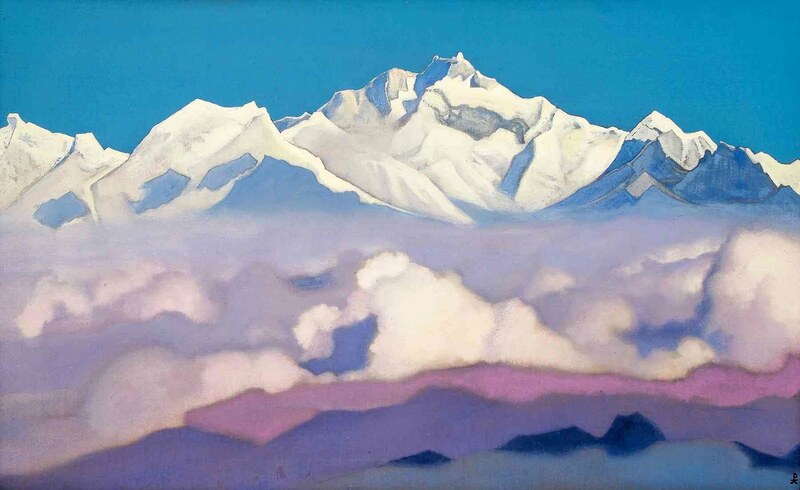 To look at a painting like Nanda Devi is to drown in that mountain’s divinity, sheer physical beauty, as well as the immense psychic power that she wields on the people who live in her shadow. 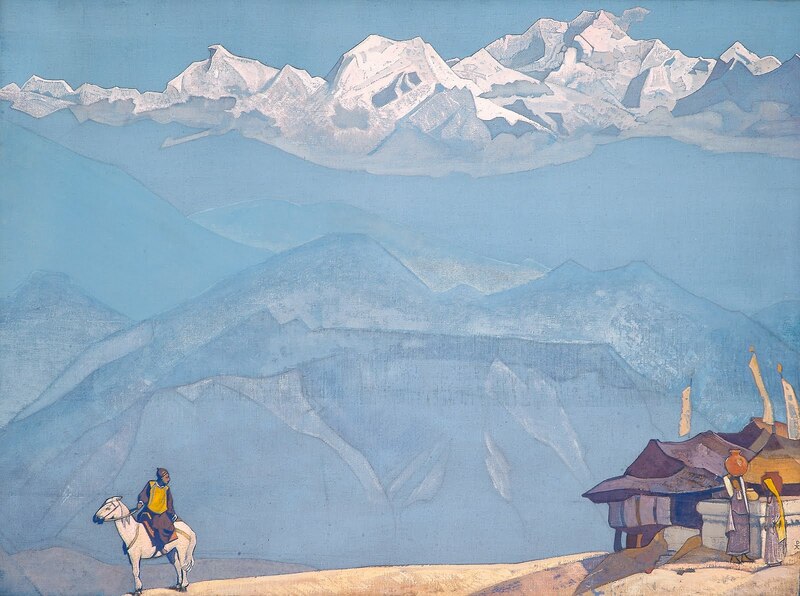 The 6 prints I have from NGMA are part of Roerich’s Himalayas series, which he contributed to sporadically over a period of roughly twenty years. 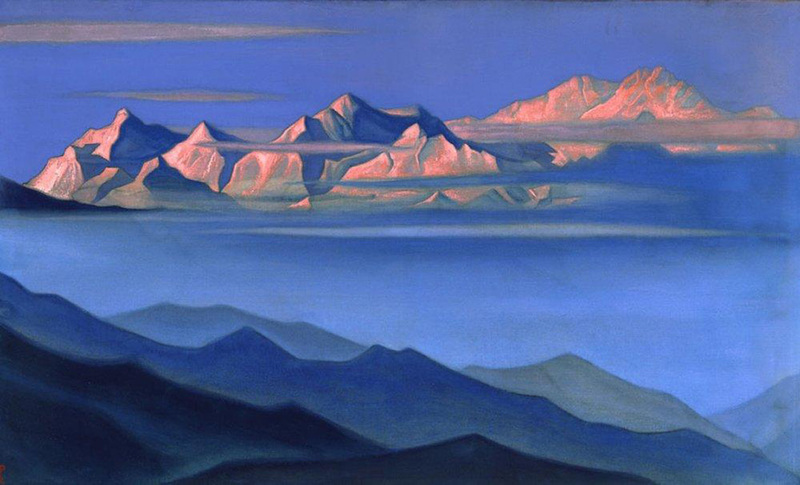 This mammoth series alone has over 2,000 paintings- a testimony to Roerich’s prolific output. All, this master painter created over 7,000 paintings over many other series, which is staggering by any standards. However, the quality of his work never suffered. 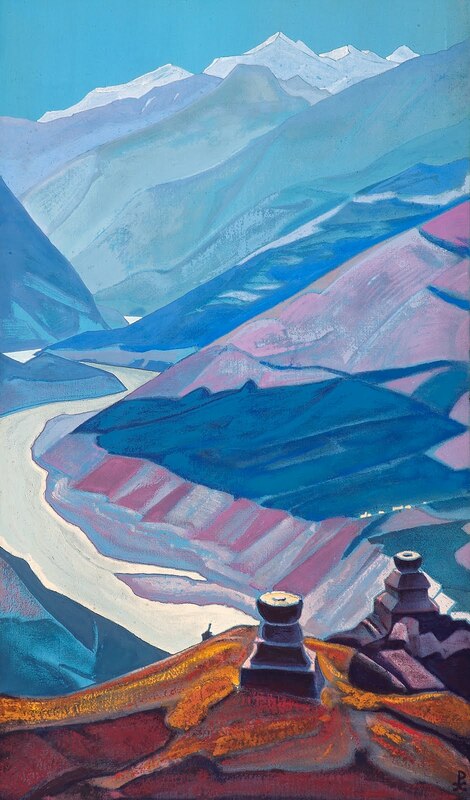 His paintings do justice to that claim, like his study of the Chandrabhaga river or the unforgettable Ice Sphinx. 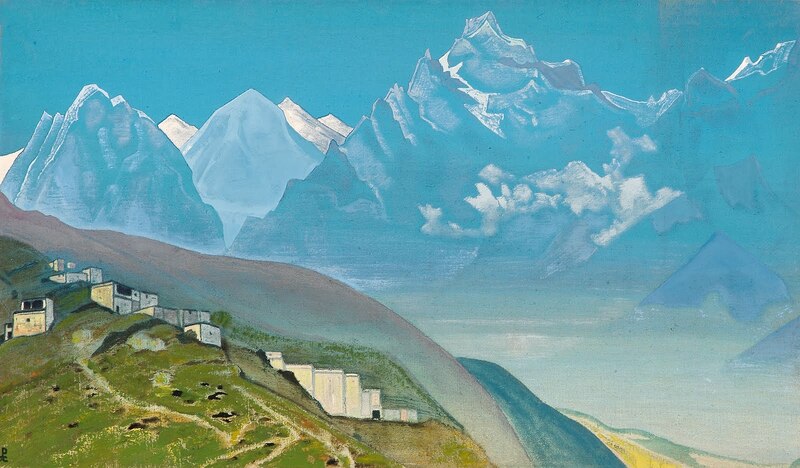 People appear only at the margins of his mountain canvases, but they’re an important part of the whole, both grounding the soaring majesty of the backdrop as well as well as providing context for the allusive stories that he tells through his canvases. Some of them bear strong influences of his earlier Iconographic art- tropes and symbolism that he adapts marvelously for his latter paintings. Even without delving too deep in his symbolism, its impossible not to come away from this huge and varied body of art without a profound sense of peace. 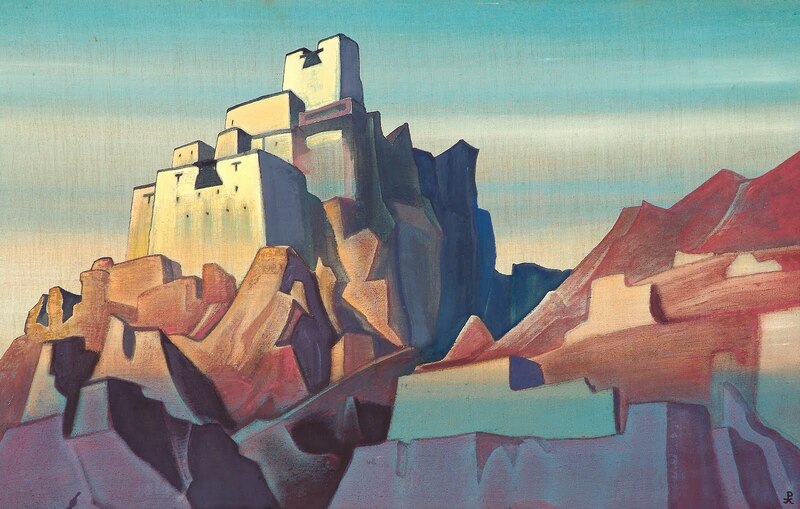 And to think he did all this, as well as create the Roerich’s Pact, and the theatrical designs for Stravinsky’s Rite of Spring! An edited version of this appeared in the Trek World magazine. Yes, do try and make a trip. 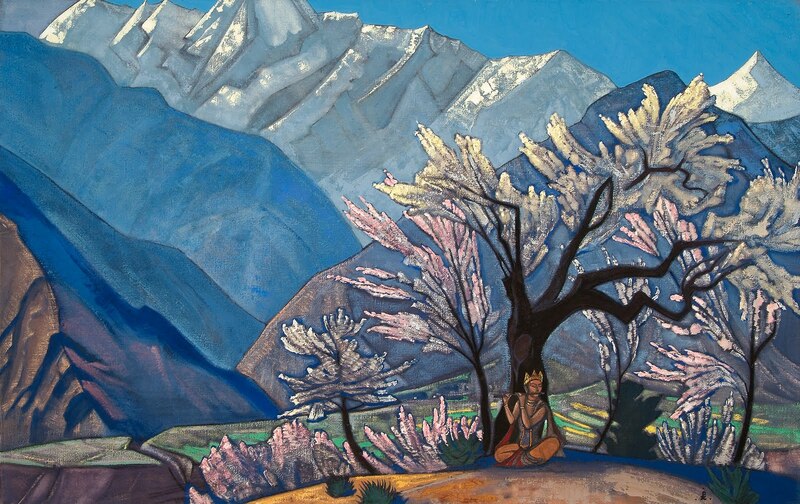 It's not very well maintained, but has its own quaint charm in true Himalayan style, winding stone steps through unkempt garden, a little memorial, a wooden balcony around the house – it's easy to put yourself in Roerich's shoes when you step in. Euryleia- Glad you liked it. AND you're a Kinks fan…even better! only blessed people stays in Himalayas.i read that the place where his house is like a varanda overlooking the valley and all those mighty peaks.no dout…. Sue- I'll be only too happy. Its a fabulous place.Thinking Cramps- You're welcome. I must visit the memorial in Naggar as soon as I can! 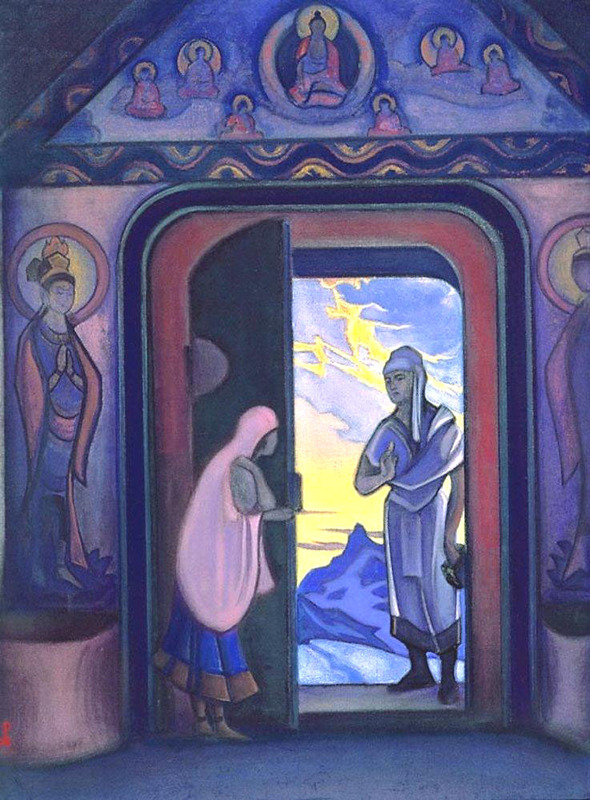 I visited Roerich's home and memorial in Naggar about 8 years ago. Your detailed post reminded me of how fascinated I was by his paintings. Thanks. All comparisons are odious. Ancient Chinese saying. Remembered that at the Void bit.I spent some time hunting down these paintings after the FB discussion yesterday. They are so beautiful. Next time I come to Delhi alone, we must go to NGMA, OK?